Robert Johnson is the Manager of International Operations at the Rare Species Fund (RSF), an international non-profit organization that works together with grassroots initiatives to protect endangered species around the world. The fund also raises awareness of the ties between human life and the natural world, funds research projects and works with governments to develop policies for conservation. By working directly with the people implementing the programs, the RSF has become one of the most effective environmental protection organizations anywhere in the world. In 2013, Robert started using DJI Phantoms for filming and capturing photographs of the fund's work, helping it explain its mission to the public and the issues it is working to solve. 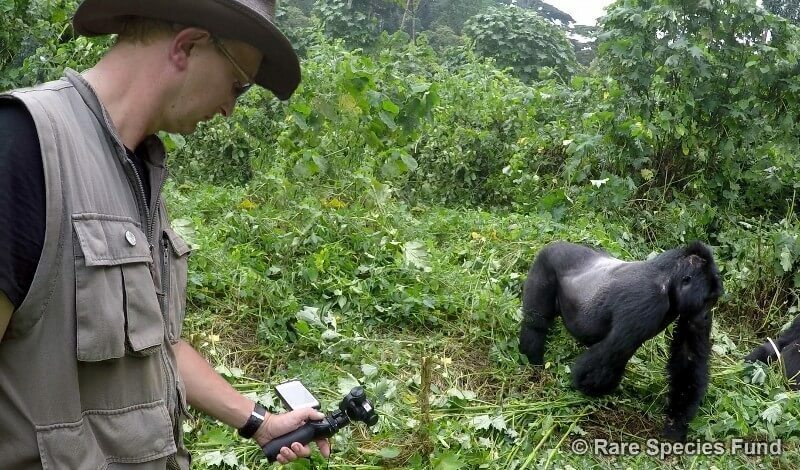 Since the launch of the DJI Osmo, Robert has also started experimenting with this handheld marvel to capture closeup video of gorillas, chimpanzees and other wildlife that is otherwise difficult to film. We asked Robert for some of his time so that we could learn more about how our technology has helped him and the fund in their incredibly important work. How are drones and aerial footage helping you raise awareness about the work of the Rare Species Fund? A large portion of conserving wildlife and the environment is to change the minds and global viewpoint of the public. The Rare Species Fund (RSF) works diligently to support grass roots wildlife conservation efforts around the world, but educating the public is key to the success of those projects. We find many people that are eager to help save the world, but are not sure how to go about it. Explaining how an individual can help with conservation often also includes exploring what practices that can be cut out of their normal daily life, practices that are not sustainable or environmentally friendly. The RSF is quite successful in sharing the story of conservation through social media and through broadcast media outlets. The first step in helping save wildlife and the environment is getting people to care. Very much like a good movie, the key to success is good story telling. The DJI Phantoms have become an integral tool in helping the Rare Species Fund explain the need for conservation. Unique perspectives, even just a few, can help turn an ordinary video into something that is much more cinematic and much more powerful. The videos we create with the help of DJI products reach literally tens of millions of people and inspire them to care about, and become proactive in, wildlife conservation. Why did you choose DJI Phantom as the flying camera to use in your work? DJI has really become an industry leader in drone filming. Their constant stream of innovations puts the ability to capture stunning aerial video in the hands of professionals and consumers alike, and does so at a very reasonable price point. With the advent of options like the Zenmuse gimbal, the user can capture rock solid footage that mimics camera moves that were only previously available by using cranes, jibs and actual helicopters. With a little practice and imagination, the DJI drones can create shots never possible before by any method. One of the best features is that it can all be packed into a hard case and taken wherever you go. Just a few years ago, the idea of a reliable flying camera platform that is both portable and affordable would have been unheard of. You have started exploring using drones as part of conservation efforts. How do you see drones being used to directly improve your work? The Rare Species Fund conducts most of its international conservation work in conjunction with community driven conservation projects that are working in-country to protect and conserve their natural resources. Having dealt with conservation projects for more than 30 years, RSF understands that just sending money overseas and hoping it goes where it should is a very complicated thing. The majority of our support for these grass roots projects come in the form of hand delivering needed equipment directly into the field, to the rangers and scientists that need it. This assures the most conservation benefit from every dollar we spend. In a recent visit to the mountainous region of western Uganda, along the border of the Congo, the RSF supplied scientific materials to an amazing organization called Conservation Through Public Health (CTPH), which monitors the health of some of the world's last remaining mountain gorillas. CTPH co-founder, Stephen Rubanga, also introduced me to a team of Uganda Wildlife Authority (UWA) officials, to whom we hand delivered camping and survival gear. This equipment will assist the UWA rangers in their task of monitoring and protecting the Bwindi Impenetrable Forest and its wildlife inhabitants, most notably, the mountain gorillas. In discussing conservation tactics with the government officials, we explored the possibility of using drones to more easily and effectively monitor the national park for poaching and other illegal activities. This would be very helpful in remote parts of the park that are extremely difficult to access. Having been there twice, I will tell you that the name "Impenetrable Forest" is very appropriate. It includes some of the densest vegetation in the world. When you compound that with steep mountain slopes, the idea of being able to remotely monitor portions of the park with a drone becomes an evermore attractive option. How have you personally used the DJI Phantom for your work? Having a drone on hand while in Uganda, I was able to demonstrate firsthand to UWA officials how monitoring would work via drone. Flying above the tree line, we were able to tilt the camera and rotate the drone to thoroughly explore the forest environment. In 30 seconds we were able to put the drone fifty feet above the peak of a nearby mountain, a location that would have required one hour of strenuous hiking to reach. Being able to see on a wireless screen what the drone was seeing was a remarkable experience for the rangers. It was also very exciting for me. To show the rangers a different perspective of the forest, in which they spend much of their life, was a real honor. After landing the drone back on the steps of the UWA park headquarters, I showed them how the footage could be reviewed after the fact to better search for signs of poaching. Flying a drone in and around a primeval forest requires special attention and techniques. The pilot is focused on successfully flying his predetermined route and positioning the camera for optimum viewing. It is extremely helpful to analyze the captured footage for any minor details missed during the flight. In a real world situation, poachers are becoming increasingly sophisticated in their approach. Using current technology to combat these illegal activities is really the way forward. The use of drones in situations such as this shows real promise as an effective tool. The Rare Species Fund has communicated with DJI about how we can best employ this technology to bolster wildlife conservation. We are very excited about the prospects. You recently started using the DJI Osmo. How did you settle on the Osmo and in what situations do you use it? I recently purchased the DJI Osmo to help in documenting our conservation work. Seeing the technology on the DJI sample videos, I was very excited about the use of technology. I pre-ordered the Osmo before its release and, after receiving it, I was definitely not disappointed in its usefulness and function. Firstly the fact that the Osmo is an "all together" handheld stabilized unit, with integrated camera, made the Osmo very appealing. The integrated joystick added additional camera control, beyond other units I have used, and allowed for greater flexibility while shooting. The ability to shoot 4K, essentially future proofs the footage I am shooting today and will allow the footage to be used, as it is, for many years to come. Like the DJI Phantoms, the Osmo is really very portable for the technology it contains. I was able to slide the Osmo and its case into the front pouch of my camera backpack. Portability is a very key requirement for me as whatever gear I take, I must be willing to carry it for many hours, up and down steep mountains in a hot and humid equatorial forest. My gear is carefully chosen based on function and portability. Seeing the Osmo in action, it was a "no brainer" that it would become an indispensable part of my kit. Are there any functions that are particularly important for you when using the Osmo? Much of the work I do for the Rare Species Fund is done by myself in some remote jungle or bushveldt in Africa. I do my best to document the work that we are doing, but must rely on myself to capture all the necessary footage. I must become my own one man film crew. The "selfie mode" of the Osmo allows me to film the action and then have the camera automatically rotate back to me to add commentary and insight into the situation, and then back to the action. The stabilization and camera quality of the Osmo are also very key to its success. In a world where you can get quite good photos and video from a higher end smart phone, many people no longer ever carry a camera. The difference is, the smart phone video still looks like a home movie. Every footstep, every breath you take is captured by the camera. The Osmo can take the same situation and turn your video into a cinematic work of art. I cannot count the number of times people commented that they were sure I had an entire film crew with me. The stabilization is effective enough that I have been able to hand off the Osmo to rangers in the field and they were able to capture some excellent footage with only a few minutes of explaining the camera. With a minimal amount of time, the average user will be able to capture some stellar looking video with the Osmo, taking their home movies to the whole next level. We're grateful for the work Robert is doing with the Rare Species Fund in helping save endangered species, and we're happy to see that he's chosen two of our most exciting products to do so. His work is a perfect display of the strengths of the Phantom and especially the Osmo, which is not only a new product but a completely new product category created by DJI. We designed the Osmo so that anyone could be able to capture professional-level footage with no effort at all, and we feel justified in saying that that goal has been accomplished. We will be following Robert and the Rare Species Fund and will let you know as soon as we have more news to share with you about the state of the Earth's valuable ecosystems.